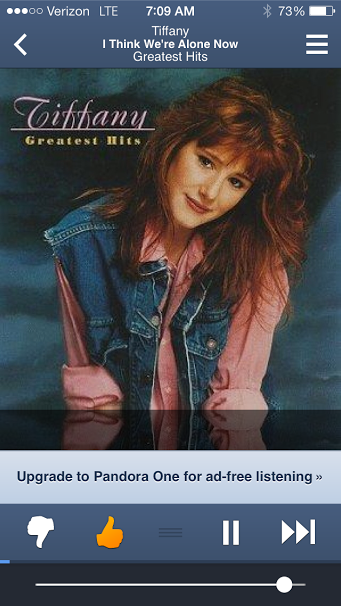 Pandora was really kind to me yesterday morning. I don’t know how Tiffany landed on a Pitbull station but I will certainly take it. Maybe Debbie Gibson will be next? 30 minutes on the elliptical plus a few minutes dilly dallying with weights for the biceps and I was done. Short workouts like this often leave me feeling fresh and ready for more but that’s just fine and how I like it. Not every day can be a long, strenuous run or challenging workout routine. 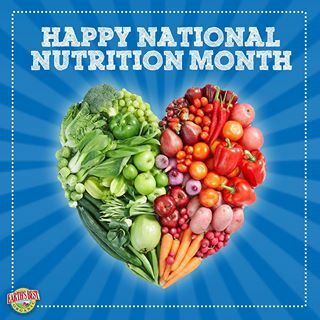 I completely neglected to wish you all a very Happy National Nutrition Month. I was all preoccupied with March 1st and Peanut Butter Lover’s Day that NNM slipped my mind. 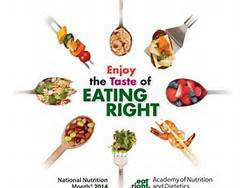 This year’s NNM theme is “Enjoy The Taste Of Eating Right”. As the Nutrition Committee Representative for my son’s elementary school, I was responsible for putting together a month’s worth of healthy eating and exercise tips to be read during their daily morning announcements as well as designing a bulletin board loaded with tips, facts and pretty nutrition pictures. Am I overthinking this a bit or is the phrase, “Enjoy The Taste Of Eating Right” bothering you too? Not really the whole phrase, more the use of the word, “Right”. I hate using words like right and wrong, good and bad, when it comes to nutrition and how we eat on a daily basis. Not only is it a poor way to speak about our choices, labeling foods in such a manner makes it seem as though there are things that are completely off-limits which is only a recipe for disaster. Once something is considered forbidden, we create an endless cycle of craving, indulging and then feeling bad about ourselves as if we did something terrible. And, who or what determines what is “right”? What I eat might be “right” for me but not “right” for you. Right? Maybe I am reading more into this than I should. Perhaps this campaign is targeted towards the majority of our society who don’t know from their 5-A-Day because they don’t even get their 5-A-Year. I just believe that everything should be “right” in moderation rather than going with the thought that loving chocolate cake is completely wrong and only eating a plate that meets pyramid standards is completely “right”. Fad diets have created an environment in which we are lead to believe that weight loss and the perfect body can happen overnight if we just give up the “wrong” stuff and only eat the “right” stuff. Wrong. Nothing magical or life-changing can happen overnight. Recently I completed my Professional Certificate in Nutrition And Sports Performance. One of the first topics covered in detail was this very topic along with the idea that the little changes, the baby steps towards a healthier lifestyle are what we need in order to reach those big, life-long lasting results. 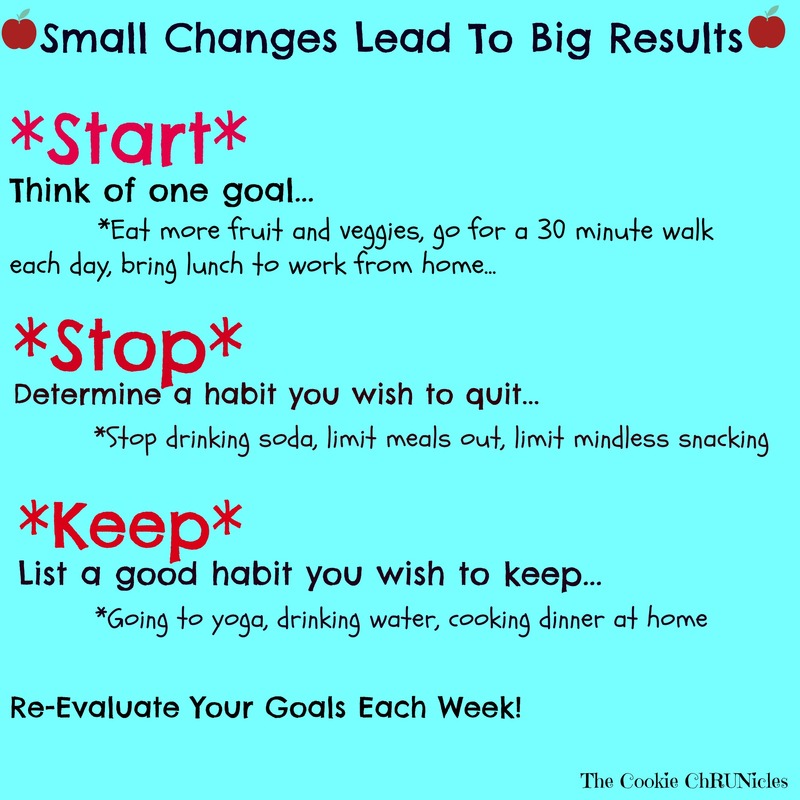 Last year I talked about the concept of “Start, Stop, Keep” which involves making small changes to our lifestyle each week that will lead us to the big results. What is so great about this concept is that you are in complete control. No one is throwing a specific and rigid plan at you to follow. I hate following someone else’s plan. Each week, you pick one thing you want to START doing, one thing you wish you to STOP doing and one thing you can praise yourself for ALREADY doing towards a healthier lifestyle. We can all make minor changes and adjustments each week, evaluate our progress and continue to build on our own success. Start: Drinking more water. Water has always been my beverage of choice. Lately however, coffee has overtaken my mornings and chewing gum later in the day has prevented me from guzzling as many bottles as I normally do. Extreme thirst has been setting in following my runs; more water is a must right now. Stop: Chewing gum. A piece or two of sugarless gum is just fine but for me, once piece leads to two, and then three, and then four and then the pack. Too much gum is not good for my stomach and affects my ability to drink water. Keep: Fruits And Vegetables. I think we can all agree that I am doing well in the produce department. In fact, I keep the local produce market in business just as well as I keep Red Mango and Cold Stone Creamery thriving on Long Island. Everything in moderation, right? Right! What can you Start, Stop and Keep this week? Am I overthinking the word “Right”? I like that start, stop, keep plan. I agree that bloggers aren’t the majority of the population. I have no problem going way overboard on my fruits and veggies requirement in a day when some people don’t get that in a month. It’s all about the perspective, but I also know that the minute i label something as “bad” it’s all I crave. Shifting that mindset towards moderation is the easiest way to make healthy changes! I’m the same way with gum. I can’t start cause then I won’t stop and all of the sorbitol kills my stomach. So glad you agree with me!